Since renewing my love for Czech seed beads, I’ve been pondering just what it is that makes Czech and Japanese seed beads different from each other. We know that there are small differences in size and shape, but are those qualities consistent with each brand, and how do they affect beadwork? I decided it was time to compare some of the major seed bead brands, and track some of the variables that make them preferable to each beader. This would not be a competition - the purpose is not to see which brand is ‘better’, but to see what separates them all from each other. There are many factors that go into choosing the right seed bead, and so long as the quality of glass is good, properties such as price, color, colorfastness, and availability usually win out. I started by selecting two colors and finishes from each of the brands I use in my designs: Toho, Miyuki, Matsuno, and Preciosa. I did not include Delicas, because although they are technically seed beads, they don’t have the same properties as round seed beads or rocailles. I briefly considered including some Chinese seed beads as well, but I decided it wouldn’t be suitable to include beads of lesser overall quality. (I also didn’t want to waste any thread on them). I chose two beads from each brand to get a good comparison, but that is about as scientific as this experiment gets. Without a scale that could accurately measure small quantities, I did my best to measure out roughly the same volume of each bead color. To begin the comparison, I strung the same quantity of each bead and placed them side by side. The differences in shape and size are apparent right away, but the real test would be in the beadwork. Next, I had to decide on a stitch to use them all with. I chose even-count tubular peyote because it would provide long swatches of beadwork to compare, and because the stitch relies on the shape and size of the beads for the best results. Weaves that allow the thread to fill in for inconsistencies - like herringbone or right angle weave - wouldn’t show the key differences quite as well. I carefully culled beads as I went, removing any that were significantly larger or smaller than the rest of the batch, and those that were visibly misshapen. I tried to use the same criteria and tolerance for each brand and color, to get the most accurate idea of which beads had the most wonky-ness. The quantities of culled beads were much larger than they would be for an ordinary project, since I checked each and every one before stitching. Typically, I’ll quickly eyeball beads or give them the roll test - turning a bead on the needle and feeling for imperfections without really looking. The first beads I used were the green Preciosa. After a few inches, a noticeable spiral effect started to take shape. I assumed that it was partly due to overly tight tension on my part - because the indent occurs at the step-up point - but also considered that the wide variety of sizes in Czech seed beads might be involved. Sure enough, when I switched to a new brand, the twist nearly disappeared, although there was a slight curl to most of the ropes throughout the experiment. The Toho beads were the least similar within a single brand in terms of shape and size, with the opaques being slightly chunkier than the transparents. And yet, of all the bead pairs, the Tohos provided the most similar lengths of beadwork, and similar amounts of culled beads. The Miyuki seed beads provided the most beadwork with the fewest culled beads, and they are also the most costly of the four. The difference in culled bead quantities may be partly due to the difficulty in spotting misshapen beads in transparent glass. 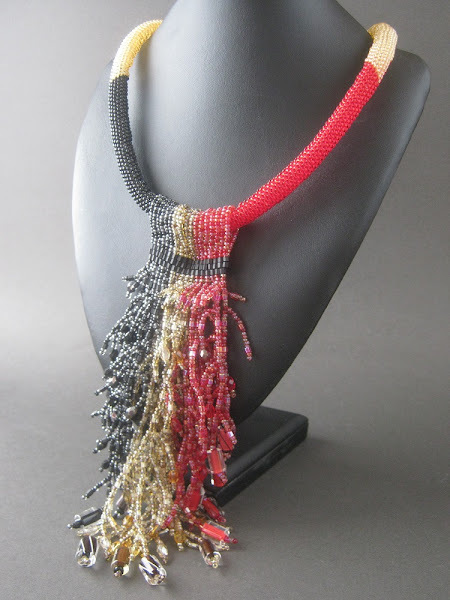 The Miyuki seed beads have the most versatile size overall, with an almost perfect barrel shape. The results of the Matsuno beadwork was the most surprising. Over the years, I have come to expect about the same quality and consistency within a single brand and finish. Both Matsuno colors were plain opaque, and yet the beadwork and culls came out quite different. The Matsuno seed beads are also noticeable larger than the others. For a final test, I created a third rope, beginning with the transparent Miyukis. I wondered if the shape of the beadwork would be affected by having a different base to work from. The Czech seed beads did fare a little better when stitched from an existing rope, but not by much. In conclusion: I feel the same about each seed bead brand as I did before beginning this experiment. Each has its own unique qualities that lend themselves well to different types of beadwork, and different types of beaders. For now, I’m still relishing the amazing value of Czech seed beads, which are ideal for my favorite techniques like netting and herringbone. 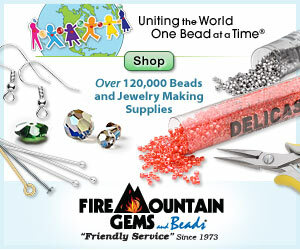 Do you have a favorite seed bead brand? Which qualities make it ideal for you? Whether you’re a bead weaver, stamper, or polymer clay smoosher, one of the best things about making jewelry is experimenting with shapes. Today I came across this gorgeous Victorian-esque choker necklace with gorgeous charms and drops. The combination of flowers, squares, circles, and briolettes has instant appeal. With so much going on in one little necklace, I tried to keep things simple with outfits that would make a great backdrop, keeping the little details like lace, fringe, and embellishments in perfect balance. I love the hint of garnet right in the center of the collar, which would be a great excuse to put on some very sassy red lipstick. The blue and turquoise stones are also small enough to leave room for extra pops of color in shoes and accessories. 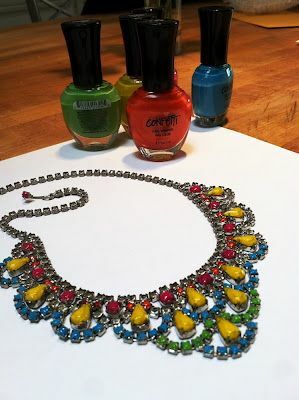 When making statement jewelry, do you focus on colors or shapes first? What’s your favorite stand-out component? If you've been reading Inspirational Beading for awhile, you probably already know that I enjoy admiring the designs of artists who work with materials that I can't - or won't - use. I suppose it's one part envy as well, especially when the art is as incredible as this. I've been a huge admirer of polymer clay since it made its truly big splash in the art world, and came dangerously close to being referred to only by a particular brand name. Back then, everyone just called it Fimo. Everyone wanted Fimo incense burners and macrame jewelry with Fimo beads. Today, there are many polymer clay brands that stand out, each with their own qualities that make them suitable for different artists' needs. And there are so many amazing artists out there putting them to the best use. These are just a few examples of the types of polymer clay designs that take my breath away, and make me wish - only briefly - that I hadn't sworn off all plastics that aren't thread. It would seem I'm particularly fond of millefiori - especially abstract designs - and polymer clay applique. 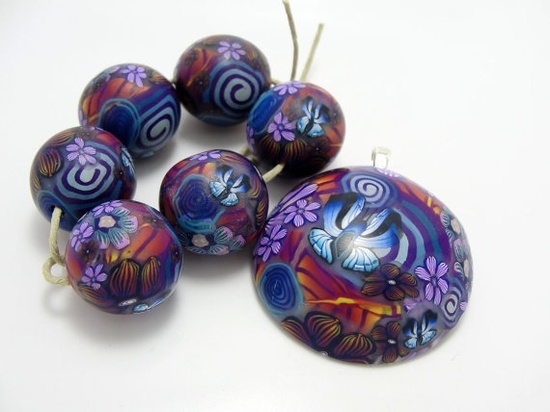 Do you have a favorite style or technique for polymer clay designs? Although I would never know about it unless I went searching through the archives, I am always surprised by how similar my current projects can be to those I was creating three years ago. I’m currently working with tubular peyote stitch, and getting a little frustrated at my own attachment to outrageous tension, which is ruining the ropes. I’ve been considering looking back on some older tube designs to see if the same problem was there, and sure enough, in Feburary 2010 I was working on my all time favorite tubular peyote necklace. As part of my series on mythology, I took a little inspiration from the three-headed Chimera to make a cascade necklace with a rope base. Even just looking at the photos, I can tell that I had much more relaxed tension back then. Too much right angle weave has created an obsession with taut threads, I suppose. Do you struggle with tension from stitch to stitch? What’s your most troublesome technique? Since finally making use of some coconut daggers, and using up the last of my coconut heishi on Khepri’s necklace, I find I’m craving organic and lightweight accent beads more and more. They have such wonderful textures that simply aren’t found in other beads, even those with a natural looking finish, like Czech glass Picasso. The earthiness is irresistible. What’s your favorite natural bead? Over the years, I’ve had a lot of different methods for keeping track of beading ideas, including notebooks and recipe cards, bulletin boards, and just letting them roll around in my head. Usually the ideas that I most want to do stay with me until I’m ready to start taking out beads, but when the inspiration for Khepri’s necklace struck, I sketched it out immediately for fear of losing it. I was waiting to fall asleep one evening, and trying to decide what to do with a few packets of opaque red 6/o seed beads. I had failed to incorporate them into two separate projects, and I want desperately to find the right home for them. As often happens, my thoughts started wandering, and I was soon thinking of bugle beads. I have more in my stash now than I ever have, thanks to the wonder of hanks and crazy spontaneity of online shopping. I was considering some patterns for ladder stitch bracelets with my remaining crystal clear bugles, and wishing that I could trust them enough for herringbone weave. Suddenly, I remembered a necklace I had made years ago, which did incorporate bugles into herringbone panels in small, secure rows. I didn’t want to make a strappy necklace; then I thought about small sections of herringbone, and before I knew it, I could see a collar that was perfect for the scarab god Khepri. I chose a palette of black with beetle greens - lemon lime, teal, and a hint smoky blue. To these I added some clear bugles, teal magatamas, and a dash of bright orange for contrast. The first stage involved creating several panels of herringbone weave, with an increase at the ends. I created a lotus-like pattern, and finished the edges with the magatamas. Once all of the panels were complete, I connected them with druks and teal coconut heishi beads. Finally, I added some netting and a clasp. 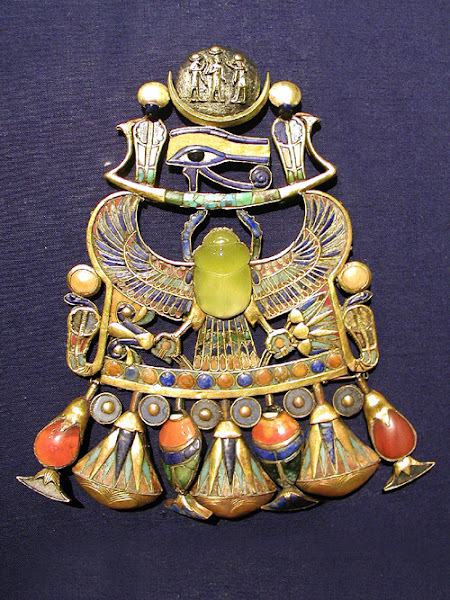 Although when I look at the piece I see the shapes of Tutankhamun’s Khepri amulet, and the shiny shells of a scarab beetle, the overall look of the collar came out a bit more Aztec than Egyptian, thanks to the feathery shapes. And even though the idea sprang from bugles, if I had to do it over again, I wouldn't use them at all.